Javi here. I'm coming to you with a special soundtrack/movie review. The reason for this amazing occasion is the subject of the review definitely goes hand in hand with the movie. I'll be breaking down the review by talking about the restored print of LE VOYAGE DANS LA LUNE, then the Air soundtrack by the same name, and finally a few words about the documentary that accompanied the film, THE EXTRAORDINARY VOYAGE. 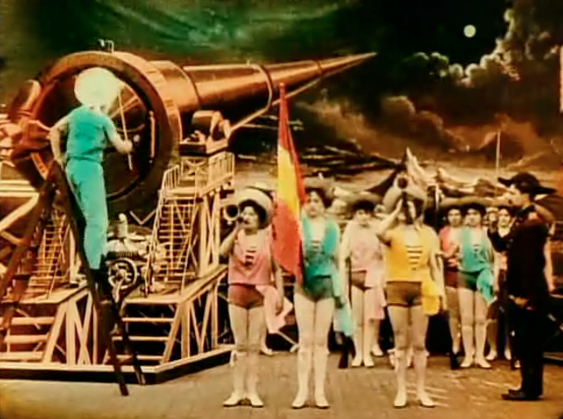 George Méliès is a well-known director among the movie nerd circles, but it wasn't until director Martin Scorcese's Oscar-nominated HUGO that his legacy was opened up to a broader audience. 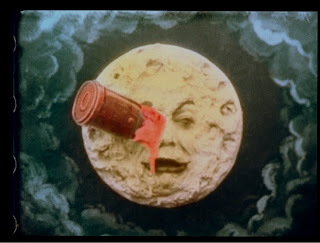 Back in 1993, a print of his famous 1902 short film "LE VOYAGE DANS LA LUNE" was found complete but in bad shape. 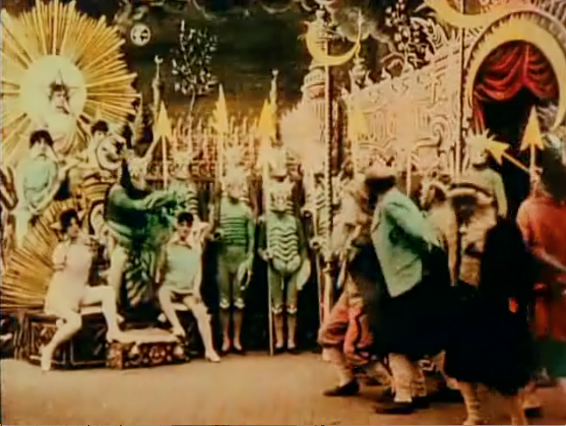 Back when the movie was shot, Méliès created one of the first color movies by hand painting each individual frame to add a yet another brilliant layer of technical wizardry. After the print was found in 1993, work began in 1999 in order to restore, rescue, and preserve the film. It took over 10 years to complete the restoration. According to the texts during the documentary, some of the frames were so badly damaged that the original one had to be inserted digitally, and then hand-painted to mimic the style of the original. It was then that the appropriately French duo, Air, was commissioned to create a new soundtrack for the restoration. Then, the newly restored print with the new soundtrack premiered to an audience during the 2011 Cannes Film Festival. Now, thanks to the awesome Texas Theatre, I was able to watch it on the big screen here. The movie has a very simplistic plot of having a group of scientists decide to create a giant bullet to take them to the moon. There was so much in regards to special effects and editing techniques throughout the whole short that were just downright impressive. Even if you don't know much about filmmaking, you can see that some of the stage was movable, and that they edited the film by cutting out individual cells, giving a lot of the trippy. But I have to admit, I got misty-eyed watching the movie. Let me just preface this by saying that I am not, nor will I ever claim to be, any sort of gifted film historian, at least not in the depths that some of my colleagues are. However, something about seeing such an old film playing across the screen just made happy in one of those very special "this is why we go to the movies" sort of ways. When the famous scene of the bullet/spaceship hitting the moon in the eye happened, I was so overcome with Harry Knowles-like glee I was this close to writing this review in all hyperbole. I truly believe if my Abuelito was here today, he would've gotten as big of a kick about seeing this as I did. Hearing the new soundtrack also made the film feel pretty modern even if people were skipping from one end of the room to the other because the print was so badly damaged. So, in terms of the actual restoration, it looks pretty fantastic, all things considered. I'd say it was a step below one of those older movie Criterion restorations. As I alluded to before, the print that was restored obviously had some major issues. There are many parts of the movie where the characters skip a good amount of frames forward. I know it's not at all the intended effect, but the skipping actually gave the movie a more surreal quality that was compounded when you took in the beautifully hand painted frames. 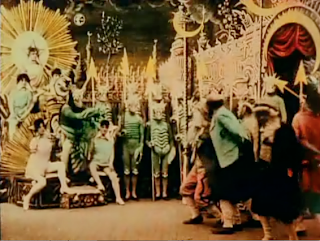 The coloration was a very strenuous technique where Méliès, along with others, painted each frame individually. Apart from that, I'm just amazed at what could be over 100 years ago. Melies had a child-like sense of imagination, and he had the creativity and resourcefulness to make his imagination pop out on screen. Apart from the special effects and the coloration, the movie has some awesome looking sets. There was the launching pad with the huge cannon that legitimately feels like it was there. And my favorite was the moon sequence with the crazy bug/lizard aliens on the constantly shifting surface. Overall, the quality of this print is actually top notch taking everything into account. Even though there were many frames missing and objects skipping around, what you do get to see looks fantastic. An additional perk to me was the fact I got to see the new Air score synced up with the print and seeing how it fits the movie. Since LE VOYAGE DANS LA LUNE was silent movie, there's no way to really of saying whether this is an improvement or not. But what I do know is, that thanks to the beauty of digital instruments, sound manipulation, and pitch shifting, Air has created a fitting score that makes the movie feel modern while also taking the disadvantages of the movie's print such as the missing frames to add something unique to the soundtrack. For example, during the first scene of the movie there was a group of classy scientists with top hats and umbrellas used as canes, who are debating about their plan to go to the moon. When one of the characters is supposed to be speaking, the soundtrack plays a vocal track that is always distorted to the point of an almost grunt. This was such a cool detail to me, given how potentially warped the sound would be if the original had had sound. This soundtrack gives us the effect of being both old and something completely new at the same time. Another example was when the crew is building the big bullet rocket ship; there were beats that coincided with the beating of a hammer, but just ever so slightly, you see that they're off from each other. Once they get to the moon, the score takes to an almost 70's progressive/space rock sound which is very new for Air. You can totally see some dude with a dragon painted on the side of his van rocking out to this...maybe that's not the greatest complement, but it added to the mood. Once they get into space, a lot of the aforementioned pitch shifting comes into place, and once again to good use. I think my favorite scene is where the scientists return to a ticker tape parade and the song "Parade" starts playing. It's such good stand alone track that has spacey sounds along with more traditional sounds signifying the change that the experience had on the scientist and the town. So the soundtrack sounds great with the movie, but how about as a stand alone piece of music? The soundtrack itself is 30 minutes or so. Just over twice as long as the actual movie, which is pretty awesome seeing as a lot of the songs needed to be a little longer to be complete. There were a few stand out tracks for me. The first one was "Moon Fever", which really seemed to be the theme of the movie along with "Sonic Armada." This particular song is basically is the whole section of the moon. A lot of the songs are expanded with vocalists that you don't hear in the movie, such as "Astronomic Club" and "Seven Stars" which make the actual soundtrack feel more reminiscent of a regular Air album. I say that it's definitely worth a buy. I've found it to be really good music to write to and even in our eerie recent foggy Texas weather; it's made for great driving music. I'm not the biggest or most obsessed of Air fans, but everything that I've always heard from them I've liked, and this feels like it's a project that has expanded their palette of sounds and techniques while still sounding like them. You can get the soundtrack over at Amazon here . The soundtrack comes with a video file of the movie, so that's a fun bonus. Finally as part three of the big multi-media review, we have the documentary THE EXTRAORDINARY VOYAGE. It's a short documentary by directors Serge Bromberg and Eric Lange. This played right after the restored movie, and it was a very interesting behind the scenes look at George Melies, his work, and his legacy. Just like with the restoration of the prints, you see that a lot of love went into this film. There are lots of very amusing cameos from the obvious industry people like Martin Scorcese, to Oscar darling Michel Hazanavicius, to an interesting portrayal of a younger Méliès by Tom Hanks. During the documentary, they show how they painted the individual frames and how ridiculously tedious it was. There were testaments by many famous people about Méliès' contribution to film, and how he pioneered the special effects that would later influence other filmmakers, including Scorcese. But I think that my favorite scene in the documentary was seeing Méliès' natural light, all-glass studio. Seeing HUGO, everybody got to see the fictional version made for the movie, but to see the real thing on film was something special. This documentary was meant to be a tribute to the famed and creative director and the movie succeeds in doing so. It's inspiring to see people that create such amazing work always look back at what came before it, and thus paying tribute to them by applying the enthusiasm and passion that their predecessors did to their own work. I am glad that a place like the Texas Theatre is around to show off movies like these around Dallas. With every other "art house" theater around going more and more corporate, it's nice to have a place that has Left Hand Milk Stout on tap and has awesome movie events like this one. You can check out the remaining show times here so you can enjoy this unique experience.